Several artists famous in both the regional and international art scene come from Bosnia. During the war (1992-1995), the production of art and culture suffered and is only just starting to recover. Visitors can appreciate incredible pieces by local painters in the likes of Sarajevo’s National Gallery and Academy of Fine Arts, as well as Banja Luka’s Republika Srpska Art Gallery. If you’re into art, check out the following Bosnian masterpieces. The ‘Enterijer sa Lutkom’ (Interior with the Mannequin) is a masterpiece produced in 1969 by Sarajevo-born Ljubovic Ibrahim. Ljubovic has a reputation for surrealism. The ‘Interior with the Mannequin’ is one of his best, depicting a dimly lit room focusing on a mannequin holding a dark brown dress. One of the highlights is Ljubovic’s expert use of natural light. National Gallery of Bosnia and Herzegovina, Zelenih beretki 8, Sarajevo 71000, Bosnia and Herzegovina, +387 33 266 551. Opening hours: Monday to Saturday 10:00am to 8:00pm. Closed on Sunday. Admission: 5KM ($3). Mersad Berber is Bosnia’s most famous artist, and introduced regional art to a wider European scene. After his death in 2012 there has been an emphasis on trying to preserve Mersad’s legacy and heritage, and some of his work is on permanent display at the Bosniak Institute. Most of Mersad’s masterpieces are in either in private collections or part of exhibitions in galleries around the world, such as the comprehensive ‘An Allegory of Bosnia’ in Istanbul. But you can admire ‘Green Saloon’ in Bosnia. Opening hours: Thursday to Sunday and Monday and Tuesday: 8:00am to 4:30pm. Wednesday: 8:00am to 7:00pm. Sundays: closed. Admission: 3KM ($1.80). Mostar-born Ismet Rizvic created some of the most important watercolour paintings in Bosnia and Herzegovina. Throughout his 35-year career, he painted hundreds of landscapes, nature works and scenes of Sarajevo. Ismet participated in several exhibitions, both as part of groups and solo. The vast majority of his work remains in private collections today. After his death in 1992, some of his best landscapes were moved to and displayed at Sarajevo’s Bosniak Institute. Bosniak Institute, Mula Mustafe Bašeskije 21, Sarajevo, Bosnia and Herzegovina, +387 33 279 800. Opening hours: Monday and Tuesday, Thursday to Saturday: 8:00am to 4:30pm. Wednesday: 8:00am to 7:00pm. Sundays: closed. Admission: 3KM ($1.80). 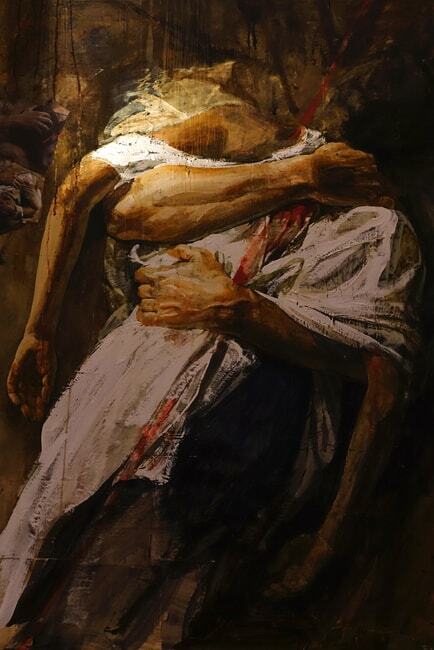 Quite a few of Safet Zec’s paintings are part of the permanent exhibitions in the Art Gallery of Bosnia and Herzegovina. The artist suffered immensely during the war, and he expresses this pain and psychological torment in his art, much of which depicts sorrow and the complex emotions felt by those haunted by war. Not all of his work fits into this category, and one in particular at the gallery’s permanent ‘Intimacies of Space’ exhibition stands out: ‘Soba moje sestre’ (My sister’s room). The painting depicts a dark coloured bedroom, which Safet admits stems from a lifelong obsession with houses and windows. When contrasted with his other work, ‘Soba moje sestre’ offers a glimpse into the complex mind of this artist. National Gallery of Bosnia and Herzegovina, Zelenih beretki 8, Sarajevo 71000, Bosnia and Herzegovina, +387 33 266-550. Opening hours: Monday to Saturday 10:00am to 8:00pm. Closed on Sundays. Admission: 5KM ($3). Gabrijel’s ‘Self Portrait’ is of a dignified looking man wearing a black waistcoat, formal white shirt and a bowtie, standing inside his gallery. The portrait, painted in 1953 using oil, contradicts many of his earlier works, which often consist of gentle landscapes. You can see his self-portrait in the ‘Intimacies of Space’ collection at the National Gallery. Other notable pieces of Gabrijel’s are now on display at Gorica Monastery in Herzegovina. Euroblic is a different kind of masterpiece. The Republic Srpska Art Gallery shows a photojournalism collection covering daily life in Bosnia’s Serb majority region. As with much regional art, strong undertones of war and politics dominate. But, one of the photos is striking in its uniqueness: the image of protesting police officers. If you’re in Banja Luka, check out the Art Gallery and experience some quirky pieces of Bosnian art. Republika Srpska Art Gallery, Trg srpskih junaka 2, Banja Luka 78000, Bosnia and Herzegovina, +387 51 215-364. Opening hours: Daily 10:00am to 10:00pm. Admission is free. Radoslav (1946-2013) was another prominent Yugoslavian artist from Bosnia in the 1970s and 1980s. His refreshing style has an eclectic mixture of poetics and structure, creating a mosaic-like pattern using primary colours. Two famous ones, ‘In the Garden’ and ‘Slikar’, are perfect examples of his unique style. The first is on display in Macedonia, whereas the Republika Srpska Art Galleries houses ‘Slikar’.